Tell us about your specific needs, and a qualified Osborne specialist will be in touch with more information! With testimonials, photo galleries, and project specifications, you'll see why Osborne is the leader in plastic injection molding! Innovation over the years allows Osborne Industries to manufacture reaction injection molding, RIM parts that are highly competitive, even at very low production volumes. Our low-cost composite tooling and specialized production methods mean our RIM molding services can compete economically with other processes for intermediate volumes of 500 to 50,000 parts per year. SPC methods control all phases of production to ensure defect-free deliveries. All incoming RIM material must meet exacting quality tests. All RIM parts are fully post-cured under controlled conditions to for optimal physical properties. Our quality assurance laboratory provides NIST-traceable measurements for accurate SPC control. The thermosets employed in reaction injection molding create polymer chains that act as strengthening backbones in the molded product, providing excellent properties in extreme temperatures. Furthermore, RIM molding is suitable for a wide range of thermosets, from structural foams to elastomeric polymers and high-impact and corrosion-resistant polydicyclopentadiene (pDCPD). Osborne has PhD chemists on staff that can help formulate resins to meet specific customer requirements. This means Osborne is not restricted to molding “off-the-shelf” resin formulations. The low processing temperatures and injection pressures allowed in reaction injection molding mean the tooling investment is often more cost-effective for large parts when compared to injection molding tooling. Altogether, these advantages make reaction injection molding the economical choice, especially for runs of thousands of parts. RIM parts are created through a process that begins when two liquid reactants – an isocyanate component and a polyol resin mixture – are held in separate tanks at an elevated temperature with agitators. These liquids are fed through supply lines at high pressure to the mixhead. When the injection begins, valves open in the mixhead and the liquids enter a chamber in the mixhead at high pressures (usually between 1,500 and 3,000 psi) and high speeds. Here they are mixed by high-velocity impingement. From the mix-chamber, the mixed liquid flows into the mold at atmospheric pressure and undergoes an exothermic chemical reaction, forming a polymer in the mold. Reaction time is usually expressed in seconds. For extremely large parts the reaction time can be extended to allow for proper filling of the mold. Our reliable, well-maintained RIM molding equipment and durable, low-cost composite RIM molds offer the production flexibility you need for your most demanding projects. Capacity: 180 lb/min. Capacity: 60 lb/min. Capacity: 80 lb/min. Capacity: 16 lb/min. Capacity: 80 lb/min. Capacity: 1.2 lb/min. What is the difference between Reaction Injection Molding and Injection Molding? The difference between reaction injection molding (RIM) vs injection molding is the method by which the material being molded is solidified. Injection molding is a process where a thermoplastic polymer is heated to its melt temperature and injected into a mold at high pressure and rapid flow rate. The injected polymer is then cooled to a point where the part has enough green strength to be removed from the mold. Reaction Injection Molding is a process where two different liquid polymers are simultaneously mixed and injected into the mold. The two liquid polymers react with one another to form a solid polymer. The reaction between the two liquids is exothermic in nature and requires this excess heat to be removed from the mold during the injection process. Is the viscosity of thermoplastic injection molding polymers greater than the reacting liquid polymers injected using the RIM process? Typically yes. Most RIM molded polymers have viscosities between water and a thick syrup whereas melted thermoplastic polymers have a viscosity similar to soft taffy. What problems occur with high viscosity polymers that are injected into a mold? Polymers, liquid or semi-solid, with a high viscosity that are injected into a mold tend to create higher internal mold pressures. There is a direct relationship between viscosity and internal mold pressures. Higher internal mold pressures require the mold to be made of higher strength materials such as steel or heat treated steel. What type of mold is used for low viscosity polymers used in the RIM process? RIM molded liquid polymers with low viscosities can be molded in medium density foam (45 pcf and greater) molds, composite molds (epoxy, polyester, etc), and aluminum. The injection of low viscosity polymers result in lower internal mold pressure which requires less strength mold materials. Can all RIM molded polymers be molded in "soft" composite molds? No. There are other factors that determine the best type of mold construction. These factors include the injection rate, the molded part size and configuration, and the peak exothermic temperature of the polymerization process. If the injection rate is too great for the mold size and configuration, internal restrictions within the mold will create back pressures that may be greater than the strength of the material used to construct the mold. Likewise, if the exothermic temperature is too great, the mold surface may begin to deteriorate resulting in poor molded surface quality. 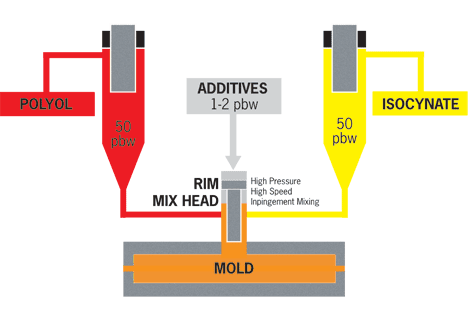 What advantages does RIM molded polymers have over Thermoplastic polymers used in Injection Molding? RIM molded polymers have the major advantage of being capable of molding very large parts owing to the ability of modifying the reactivity of the reaction. The extended reactivity allows the polymer to remain in a liquid state longer allowing a large mold cavity to be filled before the chemical reaction is complete. The longer reaction time also creates lower internal mold pressures so that "soft" composite tooling can be used for prototype and lower production applications. The lower internal mold pressure also requires less clamping force to hold the mold closed during the injection process. General internal mold pressures for RIM are 10.3 kPa to 1.4 MPa whereas injection molding will have internal mold pressures ranging from 3.4 MPa to 10.3 MPa.